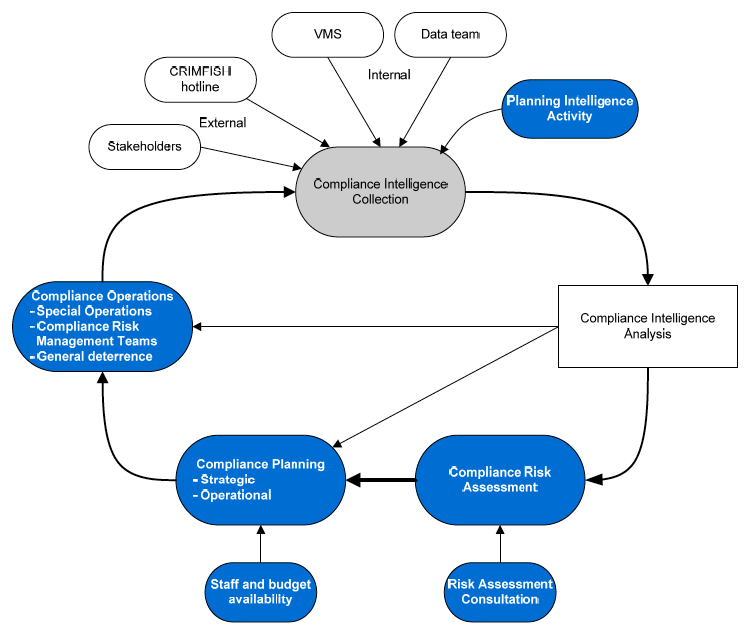 In the most recent post in this series on Risk-based Compliance (RBC) programs for fisheries, I looked at how such programs set the groundwork for a specific type of “risk treatment”, one which fits the description of what is known in mainstream law enforcement as “problem-oriented policing”. In this post, I conclude the series by considering a final “big idea” for fisheries management. Specifically, I argue that fisheries management agencies should prioritize the collection and management of compliance data. Also, once again, my case study is Australia’s management of Commonwealth Fisheries, which I see as offering a stellar example of what should be best-practice for fisheries management. Intelligence-led policing is crime fighting that is guided by effective intelligence gathering and analysis—and it has the potential to be the most important law enforcement innovation of the twenty-first century. And while its use has spiked in the past decade as police departments and federal agencies in the U.S. try to deal with the threat of terrorism, it may be applied in any number of law enforcement contexts. So why consider ILP to be best-practice? Indeed, there are mixed reviews with regards to the importance of ILP. But the fact is, the mixed reviews could well be explained by the fact that data collection and analysis does not mean the police and their overseeing officials choose to act on the intelligence. Because of this, ILP is not clearly a unique paradigm in policing (and hence, I did not mention it in the last post). If we look at another policing model called “Evidence-based Policing”, however, we find thattargeted policing with strong data collection and analysis can indeed have very strong impacts on crime (see here, here, and here). So what does ILP look like in a fisheries context? And with this intelligence, AFMA produces an average of 15 information reports per month on such issues as: VMS non‐compliance; quota evasion; closure breaches; and suspected fishing in Commonwealth marine reserves. These analyses are also used to produce materials to direct strategic inspections at ports, which is collectively called a “port pack”. The port pack specifically contains: the priority ports and vessels to be inspected; vessel profiles; a threat assessment; intelligence tasking requests (for example, seeking up‐to‐date skipper and crew details, or observations of equipment being used); and relevant information reports. Aiding the production of intelligence reports are also several tools of note. Collectively, I believe these tools put AFMA far ahead most fisheries management agencies elsewhere in the world in terms of sophistication. The first tool is JADE, a case management software, which has the functionality to link case descriptions to supporting documentation, providing a comprehensive record of enforcement actions. Though it certainly makes sense to have case management software for fisheries enforcement agencies, and such is the standard in mainstream law enforcement, the fact is that such systems are rare in the majority of fishing countries. The second tool is what is called the Multiple Risk Aggregation Index (MRAI), which is used to determine which vessels are more likely to offend compared to others in the same port, fishery, state or territory. This index certainly stands out as a clever tool given the raw inputs, which perhaps most importantly includes within it a boat-cash income analysis. That is, if a boat doesn’t appears to be operating profitably, you’ve got to wonder if it’s not doing some business off the books. The 2012-2103 audit notes that the MRAI is produced with the following bits of information. The MRAI aggregates the weighted ‘scores’ of these risk indices to determine a score for each vessel out of 100. The higher the score out of 100, the higher the risk of non‐compliance. Once each vessel has a risk score, it is then possible to compare and rank vessels by port or by fishery, which also allows for targeted inspections or operations to be planned based on the highest risk. The third tool is still in development stage, but will likely be another standout once it is implemented. This tool is a “quota evasion detection tool” that will consist of business intelligence software to audit catch records and receiver reports. As noted by World Fishing & Aquaculture, such auditing can be incredibly time-consuming when done manually. Ultimately, if these tools were to spread to other countries, I think you would see a very positive impact on compliance rates.